Minford’s Darius Jordan breaks a tackle and moves upfield on Friday evening. West’s Dylan Bradford drops back to pass against Minford. WEST PORTSMOUTH — When a team comes off an exhilarating high like the West Senators’ football program did last week, one might expect a little bit of a letdown. However, if there was any kind of a letdown in each of the phases that comprise the game of football, it was certainly hard to tell for the No. 4-ranked program in the Ohio AP Division V Football Poll. West used two touchdowns apiece from Garrett Hurd and Cody Staggs and another gritty effort from a stingy defense that forced two turnovers and gave up just 181 yards of total offense to obtain a dominating 50-6 victory over the Minford Falcons — the largest margin of victory for either side since the turn of the millennium — to move to 6-0 on the year. For Ben Johnson, it was business as usual for West, who has now outscored its opponents by an average margin of 188-71 over the course of the 2017 campaign en route to its highly esteemed ranking. 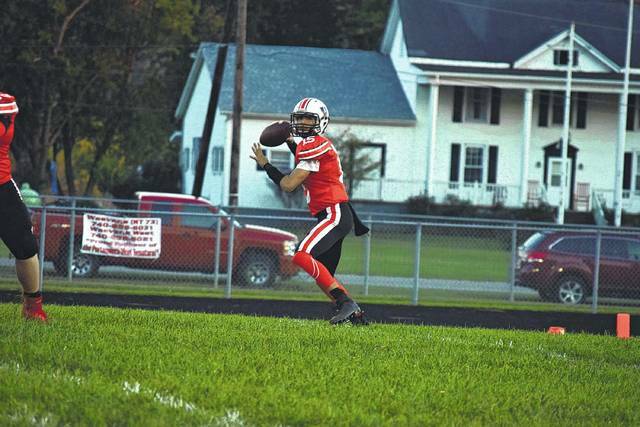 As for Jesse Ruby, the result is one that the Falcons, who are 2-4 on the year, will have to put aside in a hurry if Minford wants to continue growing. Ruby and the Falcons, however, came out with an excellent idea. In knowing that West hadn’t seen a team who had employed an empty backfield yet in 2017, Minford not only came out in empty, five-wide sets throughout its first series, but ran the aforementioned sets well. Kelton Kelley, in fact, found Caleb Dunham for a nine-yard gain on the first offensive play of the contest and completed two additional passes to Breydan Tilley as the Falcons moved the ball down to the West 42. However, after obtaining a pair of first downs, West’s defense, as it has all year long, bowed up. A three-yard run from Kelley was followed by two passes that were stuffed in their tracks, which the Falcons to put the ball away from the West 39. From then on, the contest proved to be filled mostly with momentum of the Orange and Black variety. After getting the ball from its own 17-yard line, it took West only three plays to strike with the opening salvo, as Bradford, who rolled to his left initially, escaped Minford pressure, rolled back to his right, and, despite taking a hard shot after releasing the football, found Josh Berry right on the money smack-dab in the middle of the field. Berry then outraced the Falcon defense down the far sideline as the junior turned the third-and-nine pass play into a 70-yard touchdown reception that put West up 7-0 with 8:06 remaining in the first quarter. On Minford’s second drive of the affair, the Falcons, again, showed flashes offensively as Kelley found Jordan Bowen for a 16-yard gain on the game’s second play, and two plays later, found Darius Jordan for 14 additional yards as Minford advanced down inside the West 45 yard line. But after two one-yard gains from Kelley and a four-yard sack by the Senators, the Minford drive stalled out at the West 46, which forced the Falcons to punt the football away once more. There, West really showed the crowd in attendance what it has done all season long. After starting its second straight drive inside its own 20, the Senators went on a commanding 13-play, 82-yard drive that took 4:57 off of the first-quarter clock. A 15-yard run by Bradford and a 42-yard pass from Bradford to Gabe Skaggs on the same drive ultimately set up a one-yard touchdown pass from Bradford to Sid Shifflet as West took a 14-0 lead with 54 seconds remaining in the first quarter of action. While the offense continued to click from a ball-control standpoint, the defense really showed its wherewithal over the remainder of the contest by only allowing one additional Minford first down over the remainder of the contest after the Falcons collected three on their first pair of series alone. A Minford three-and-out in the second quarter eventually led to a booming 44-yard field goal from Drew Cassidy, and just two plays into the next series, Staggs picked off an overthrown ball from Kelley and returned it 32 yards to the house as the Senators established a 24-0 lead with 9:47 still to play in the opening half of action. Overall, Staggs’ pick-six was the first of two turnovers that West forced on the evening — all while not committing a single one themselves on the offensive end. The result, you ask? A plus-10 turnover margin through six affairs (15 takeaways to five turnovers) in 2017. After the scoring ceased for several minutes, Elijah Vogelsong, who proved to be a dependable receiving threat all evening long, was able to give Minford a sign of life as the 5-8, 155-pound freshman caught a 64-yard touchdown pass from Kelley to cut the lead to a 24-6 margin with 3:11 to play in the first half. Vogelsong ended up leading the team in receiving yards by collecting 77 yards on four catches. However, the excitement of Vogelsong’s big play was short-lived for the Falcons. Seven plays later, West, after starting from its own 30 yard line, obtained another big passing play on third down as Staggs, who was one-on-one against Tilley, outleaped the latter for the football, caught the ball on the near sideline, and raced 36 yards for another Senators’ touchdown that capped a seven-play, 70-yard drive and put West up 30-6 with 1:31 to play in the second quarter. The Senators, however, were still not finished. Two plays into the ensuing drive, Kelley was hit as the junior tried to release the football, which allowed Berry to pounce on the pigskin at the Minford 42. There, West went to work again. After a brilliant 12-yard pitch-and-catch from Bradford to Caleb Journey — who is expected to be fine following a blow to the head following a hard landing on the grass — the junior connected with Hurd on a screen pass. Hurd, ever the sneaky and athletic runner that he has proven to be, took two steps straight toward the West sideline, then zoomed through the Minford defense like a snake weaving through a forest as the running back scored from 30 yards out to accumulate a backbreaking touchdown en route to giving West a 37-6 lead at halftime. With the ball back in the Senators’ possession to begin the second half of play, West wasted no time making the contest a formality as Hurd — who ran for 106 yards on just 10 carries and collected 136 all-purpose yards on the evening — capped off a six-play, 58-yard drive with a 23-yard spurt to the house to give the Senators a 44-6 lead as Hurd, Berry, Bradford, and Staggs combined for six of West’s seven touchdowns on the evening. With the game well in hand, both units were able to get their younger athletes some needed playing time. West’s Joey Cyrus and William Journey responded in a resounding manner, as the duo ripped off several nice runs in relief. Journey ultimately added the game’s final score on a two-yard touchdown run to set the margin. With the victory, West not only moved to 6-0 overall and 1-0 in SOC II action, but continues to set itself up well in its own quest to position itself well for the playoffs. However, Johnson’s main concern, as of now, is going after an SOC II title. Week 2 of that four-week quest begins next Friday when the Senators travel to Valley for a primo bout between two storied programs. As for Minford, the Falcons, who are 2-4 overall and 0-1 in SOC II play, sit in a tough spot as far as the playoff scenario is concerned. According to Joe Eitel, Minford sits 17th with just 3.47 points on its average — which means that the Falcons will need to take care of business the rest of the way through. 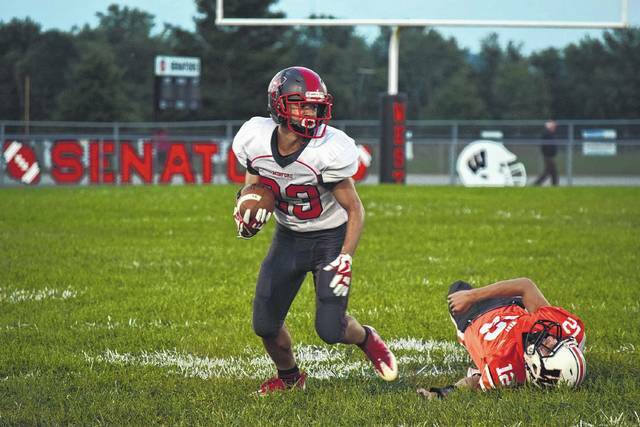 Division II Logan awaits Minford next week at home in a nonconference bout.